Call of Duty fans around the world are jumping into the Call of Duty Blackout beta. It offers a taste of Call of Duty’s first ever battle royale mode, with a giant map made up of a collection of classic Call of Duty levels. In this Call of Duty Blackout Guide, we’ve got a ton of info to get you started. We’ve pulled together some Call of Duty Blackout Tips and Tricks, some advice on how to use the wingsuit, and more. 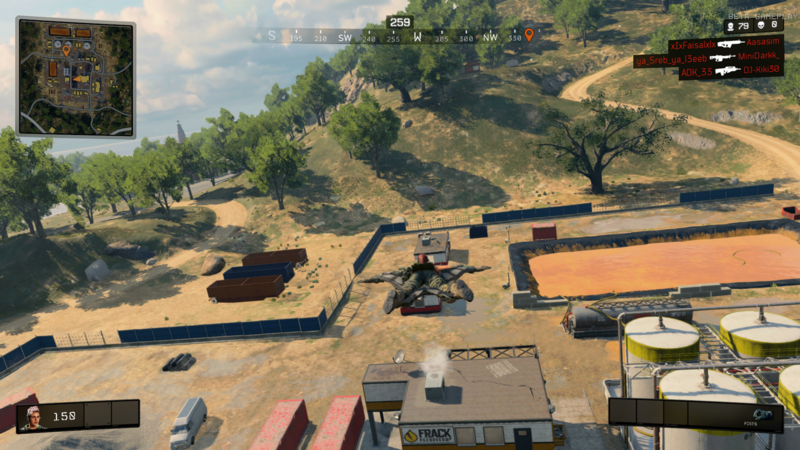 For a look at the Call of Duty Blackout Map, broken up into its separate locations, head over to our Call of Duty Blackout map guide.You’ll want to take a look before jumping into Blackout, so that you can workout where you’ll want to drop in. As we spend more time with Call of Duty Blackout, we’ll be bringing you guides on key aspects of the game. We’ve listed what we have so far below, but be sure to check back for info on Blackout weapons, vehicles and more. We’ve been playing Call of Duty Blackout a fair bit this week, and have been busy putting together some Call of Duty Blackout Tips and Tricks to help you get started. They range from advice on close range engagements, a look at the best way to heal, and when to use your special items, let’s get started. When jumping out of the chopper at the start of the game, point the camera down to fall faster. You’ll want to jump out when you’re directly above your drop point, so that you can be the first to reach the ground. For your first few games, we’d recommend dropping at the Firing Range. It’s the busiest part of the map and is a great way to get to grips with how the shooting feels. The gunplay is not the same as it is in Black Ops 4. You’ll notice bullet drop more clearly, and the at long-range, guns feel completely different. There are special items that you pick up while looting, items which grant you special abilities for a limited time. Use these as often as you can, as they provide small advantages, and they won’t help you when you’re dead. The Specialist equipment used in Black Ops 4 plays a role in Blackout too. You can pick up items like Ruin’s Grapple Hook, or Torgue’s barricade, and use them the same way as in the regular game. Melee is pretty useless in its current form, so don’t sneak in for a melee kill thinking you’ll KO someone in one knife hit. Use shadows, and go prone when you can, It’s incredibly easy to hide in Call of Duty Blackout. Wait for the circle to draw out the last man standing before moving yourself, especially if you’re in a building or elevated position. Triangle in menu to switch selected weapon. Call of Duty Blackout begins just like any other Battle Royale game, jumping down from the sky. The difference here is that you get a wingsuit, allowing you to travel further and better reach your desired starting location. What you might not know is that after landing, you can actually use your wingsuit whenever you want. All you need to do is hold sprint then jump off of a building holding the jump button. This only works if you are high up enough, though in our experience three stories seems to be the sweet spot. 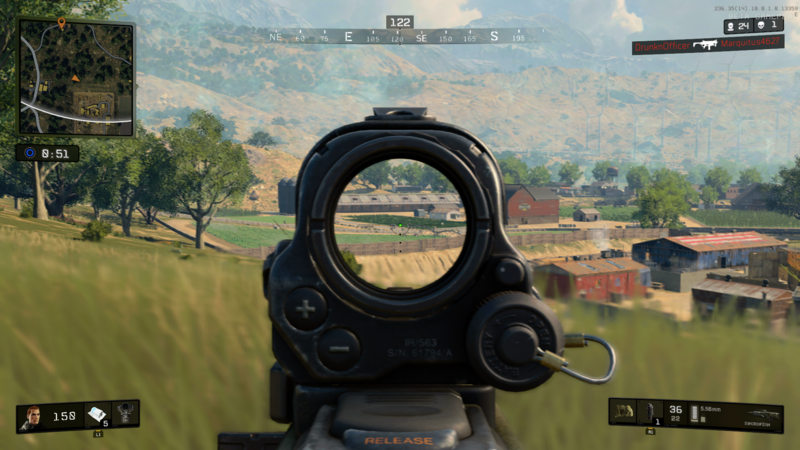 Much like in PUBG, Call of Duty Blackout features Supply Drops. They occur during each mach, and you’ll know if one is being dropped by an announcement by the announcer. You will then hear a plane and can follow the sound to work out the general area where the crate will drop. Once it has dropped, smoke will start to spew from the Supply Crate, and you’ll need to approach it to loot. Supply Drops are filled with the best weapons and armor in the game, including level 3 armor, the only one that will protect you from headshots. While out looting, you may come across special items that momentarily grant extra abilities. These are called perks, and should be picked up and used whenever possible. We’ve included all of the Call of Duty Blackout Perks in the following list. Firing Range – We would encourage you to drop into Firing Range. It has a high concentration of loot, and you’ll get into shootouts early on. Firing Range is a great place to hone your shooting skills, and is easily accessible given how many vehicles can be found in the immediate area. Construction Site – The Construction site has really great high ground advantage, so if you can get a decent assault rifle and a scope, you’re sitting pretty. We’re still pretty early on in our time with Call of Duty Blackout, so we’ll be bringing you more thoughts on the best places to drop shortly. That’s everything we have on Call of Duty Blackout. We’ll be updating these pages once we’ve had more time to play the game, and when it launches fully. For more info on how to participate in the beta, head to our Call of Duty Blackout Beta Guide.